These huge seabirds - wingspan up to 1.75m (nearly 6ft) - fly with slow, graceful wing beats and suddenly plunge in spectacular style to seize fish below the surface. At breeding time they gather on rocky islands and rock stacks off the rugged coasts of north and west Wales, western England and the coast of Scotland, and most notably the islands. 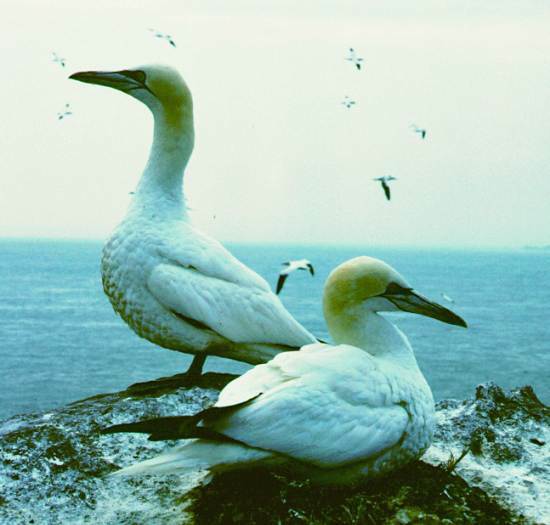 (There are smaller colonies in many other coastal regions of Britain, and they are also very common sights on some parts of the Irish coast.In March or April, gannets usually lay just one egg in a nest of seaweed and tufts of grass or of Sea Pinks (sometimes referred to as Thrift). 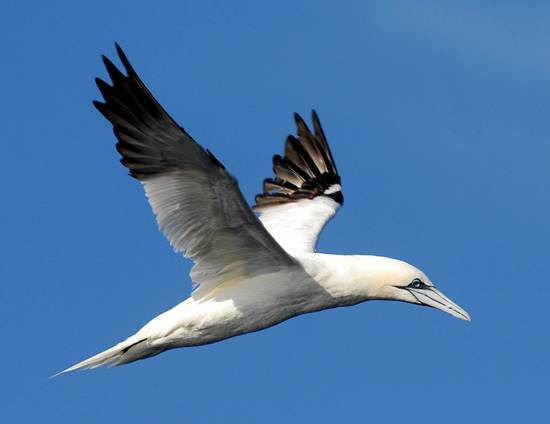 219,000 Gannet nests around Britain were recorded in 2004, and at that time about 300,000 pairs was assessed as the European population, according to Birds in Europe, published by Birdlife International.